Thank you for scheduling appointment with us. A confirmation mail will be sent to you soon after admin approval. Click Here to book another appointment. 4212 E Valley Mesa St. Petter , Ohio United State. © 2018 Toto Dental. Website Designed by Creativity Design Group. Dr. Le completed his Doctorate in Dental Surgery degree at University of Texas Health Science Center at Houston Dental Branch in 2011. He is a recipient of the American Academy of Periodontology Dental Student Award for Achievement in Periodontology. This honor is given to the graduating senior at each dental school who displays the highest level of academic and clinical achievement related to periodontics. Dr. Le completed his advanced education program in periodontics at The University of Texas School of Dentistry. His research interest is in the area of dental implants supported overdentures. 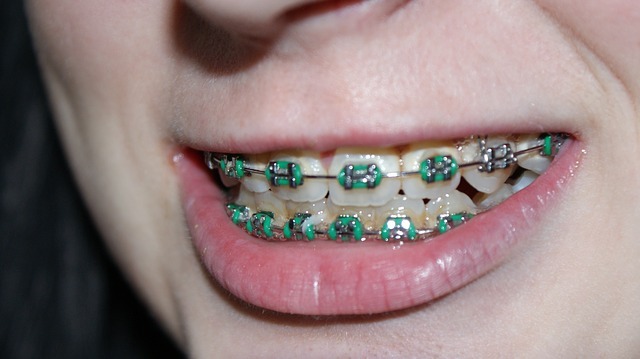 Orthodontics is the dental term for braces. It is the process of re-aligning your teeth into their proper positions. It is a way of straightening the teeth for health and aesthetic reasons. Pulpotomy is the treatment performed for severly decayed baby tooth. It is often referred to as a baby root canal, but is not as strenuous as the root canals performed on adults. Pulpotomy is normally performed when the decay has already reached the nerve and if left untreated will potentially lead to infection. 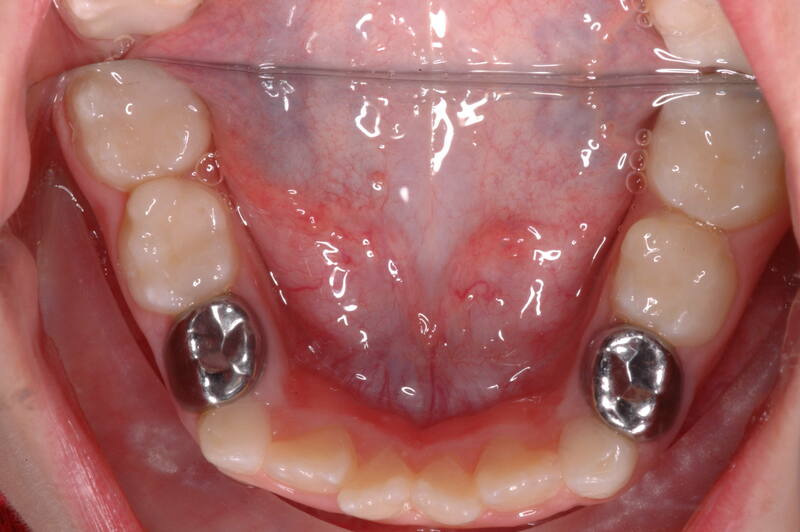 After a pulpotomy is performed, a stainless steel crown is put on top of the tooth to protect it from any type of fracture in the future, until the baby tooth is ready to be extracted to give way for the adult teeth to grow out. 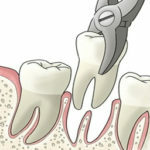 Root canals are dental procedures used to treat and preserve teeth with badly infected roots. The pulp is the live portion of the tooth containing nerve and blood vessels. When it becomes infected due to decays and bacteria, patients can experience pain, swelling which if left untreated, patient may lose the tooth. Root canals process removes the damaged parts of the infected tissues inside the tooth and seal it from further bacteria invasion. An antibiotic is also usually prescribed to help prevent further infection after the root canal procedure. The remaining portion of the tooth may be restored using a cap or crown that provides a natural appearance and normal tooth function. Dental implants are surgical-grade root devices that support permanent tooth prosthetics. They are very durable and with care can last a lifetime. These artificial roots are placed in the bone beneath the gums where they become incorporated into the jaw resulting in a strong foundation for the permanent restoration. A crown is mounted atop the implant for a long-lasting and natural looking smile. Many dentists and patients prefer dental implants because they offer the same function as natural teeth and also help prevent bone atrophy in the jaw. 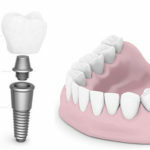 Dental implants may be used to replace a single missing or damaged tooth or to restore an entire smile. Dentures are removable dental appliances designed to look and function like natural teeth. There are several types of dentures – complete denture and partial denture. Complete dentures replace the entire arch of missing teeth for patients. Partial dentures replace some of the missing teeth in the upper or lower arch of the patient. Dentures make it easier to eat and speak than you could without teeth; however, it can only functionally replace up to 25% of natural teeth. When patients have missing dentition, they appear older due to the lack of support for the facial muscles. Dentures can also provide for a fuller, more youthful appearance by providing a replacement for the missing support. Many dental patients elect dentures for tooth replacement if they are not candidates for dental implants or are otherwise looking for a tooth replacement option that is more affordable and budget-friendly. 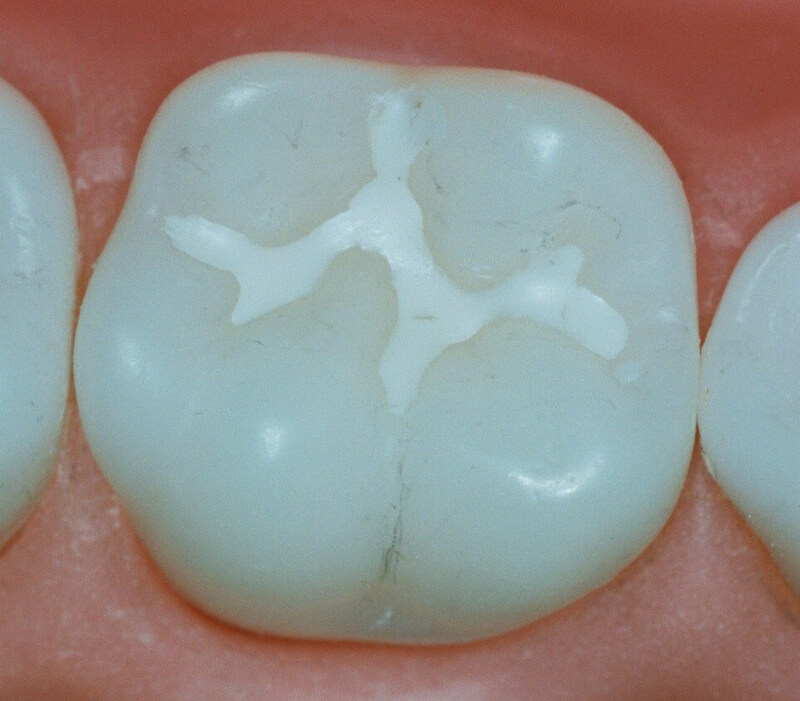 Bridges and crowns are fixed custom prosthetics that are cemented onto existing teeth. The most common fixed prosthesis is crowns (also known as cap) which are used most commonly to entirely cover a single damaged tooth or cover an implant. 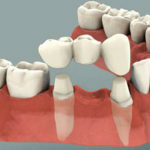 Bridges are used to replace space with multiple missing teeth. They are cemented to natural teeth or implants surrounding the space where the tooth once stood. Composite fillings (tooth-colored fillings) are dental restorations that blend with the patient’s existing teeth color and look natural in appearance. They appear more natural than amalgam fillings, which are darker and more easily seen by other people. Composite fillings are made of compounds that chemically bond to the teeth. The chemical bonding of the restoration to the tooth structures allows dentists to preserve more tooth structure when removing decays on the tooth. They can be used to help repair chipped or broken teeth. Composite restorations are used to treat the teeth closest to the front of the mouth and in areas where they might be noticeable when smiling/talking. They can also be used in the posterior molars area depending on the size and location of the cavities. Extraction means getting the tooth removed, usually due to infection caused by gum disease or severe decay. The back teeth naturally have many depression, grooves, pits and fissures where bacteria and foods are easily stick to and hide where eventually cause cavity. Sealants are thin protective coating placed on the tooth to prevent cavities. These coatings go into the groove of the tooth’s chewing surface and prevent food particles from getting stuck. Deep cleanings are for patients with gum disease that are caused by plaque buildup that aren’t cleaned well over a long period of time; these plaques harden and form underneath the gum-line and cannot be removed by normal brushing or flossing alone. Deep cleanings are done by dental professionals using dental instruments that are specifically made to clean tartar or calculus build up at the root structures underneath the gum-line. The mouth is an area in our body that can accumulate quite a number of bacteria, from the food and drinks we consume, to how well we maintain our oral hygiene. 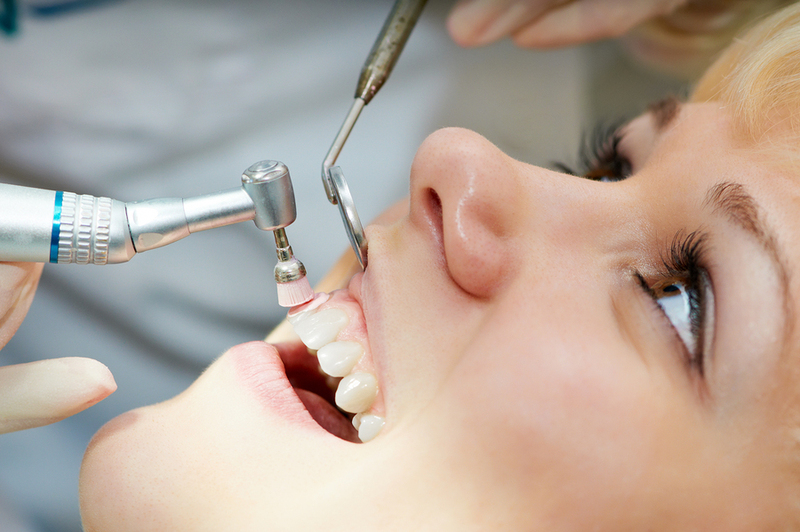 Teeth cleaning are very important as it helps remove the buildup of plaque and tartar. A professional cleaning is done by either the dentist or dental hygienist where they use professional dental tools to remove tartar from your teeth – both above and below where the gum meets the tooth. 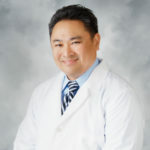 Dr. Thuan Dao is a graduate from University of Texas Dental School in Houston, Texas. He has over 15 years’ experience providing dental care for patients in the Houston areas. Dr. Dao mission is to provide quality dental care with minimal discomfort and providing patients with dental information so they can better understand and improve their oral health. 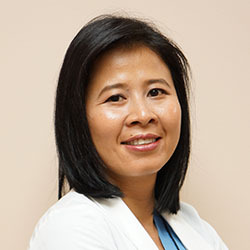 Dr. Hai Khanh Tran graduated from Baylor College of Dentistry, in Dallas, Texas, where she was a recipient of two distinguished awards: Quintessence Award for Clinical Achievement in Restorative of Dentistry and General Dentistry Program Award. She loves dentistry with a passion and is very enthusiastic about her job. 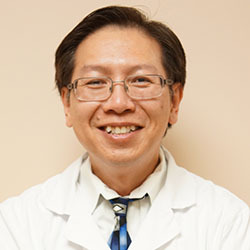 Moreover, Dr. Tran has been the guest speaker for many Implant and Treatment Planning Seminars. She participates in Literature Review where she and other dentists discuss and learn about dentistry in research and science in concurrent with dental aspects. As a caring provider, Dr. Tran listens to all her patients’ concerns and fears. She makes it her mission to give in-depth explanations to her patients to help them understand the status of their dental health. Dr. Tran understands that every patient has a different financial background and does her best to guide them towards the best options for their treatment.